Sesam Business Consultants and Hamburg Health Consultants are the official German agent for Saudi Medicare 2011 in Riyadh, Kingdom of Saudi Arabia. 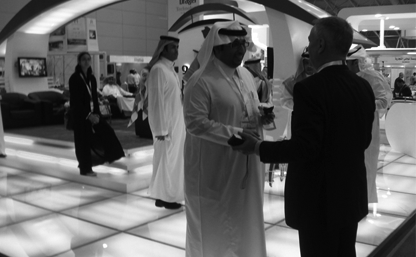 Sesam is promoting selected trade fairs in the United Arab Emirates and Saudi Arabia. We are supporting exhibitors with booking their stands and making the most out of their exhibition participation. Sesam has worked successfully with local and international public institutions and organizations as well as private companies in the past and is looking forward to expand the trade fair section of our business in 2010/2011. We have tailor-made products on offer for individual companies as well as industry associations and public bodies looking to participate in Saudi Medicare and other fairs. Sesam Business Consultants and Hamburg Health Consultants are the official agent for Saudi Medicare 2011 in Riyadh, Kingdom of Saudi Arabia. Sesam is responsible for promoting the exhibition in Germany, Austria, Switzerland, the Netherlands and Canada. The fair will be held from May 16 to 19, 2011 in the Riyadh Exhibition Centre. Saudi Medicare is the most important fair for the Saudi healthcare market, the Saudi market being the largest in the Arabian Gulf region. The main product categories featured at Saudi Medicare are diagnostic equipment, surgical equipment, laboratory equipment, disposable products, hospital furniture, implants, dental care products and optician and ophthalmology products. Promotional information seminars will be held in major cities (Hamburg, Berlin, Dusseldorf and Munich) in Germany autumn and winter 2010/2011. For more information please visit www.sesam-uae.com/saudi.